What is the CZ-50 or CZ-70 pistol? The ČZ-52 pistol is a very popular Czech military surplus firearm. However, there is some confusion between that pistol and other similiarly designated ones from the same armory. Let's see what the ČZ-50 and ČZ-70 pistols really are. Česká Zbrojovka vzor 70 pistol. Let's start with the name of the CZ-50. The pistol is commonly called the CZ-50. However, it isn't exactly a CZ-50 (or CZ-70, for that matter). The real name is Česká Zbrojovka vzor 50, usually shortened to ČZ vz. 50. 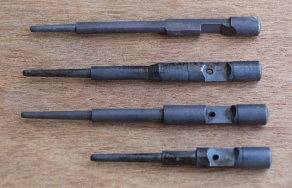 The Czech name Česká Zbrojovka means "Czech Armory". You would pronounce it as Cheska Zbroyovka. To be completely authentic, a Czech would pronounce ČZ as cha zet. Vzor, commonly abbreviated as vz., means "model". So, a literal translation of its full name is the Czech Armory Model 50. Compare that to a name like the Springfield Armory Model 1911. The Ministry of the Interior requested a new pistol design from ČZUB, Česká Zbrojovka Uherský Brod, soon after World War II. ČZUB is a major arms producer in the small town of Uherský Brod in the Czech province of Moravia. The resulting design was a close copy of the Walther PP and PPK in .32 ACP. It was designated as the ČZ-50 or vz. 50. 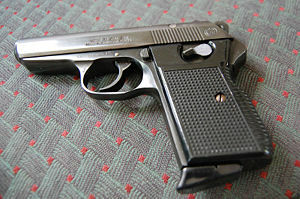 The ČZ-50 was sold commercially, but most were produced for the Ministry of the Interior, who issued them to law enforcement agencies. The top of the slide was engraved with a fine wave pattern intended to reduce glare. The serial number was now stamped on the slide under the ejection port, rather than below and behind it. The take-down lever surface was cross hatched rather than grooved. The hammer was enlarged, and a hole drilled through it. The magazine release was made smaller. The base of the new magazine was made less curved and more angular. Many Vz 50s bear a Czech government property stamp bearing crossed swords. Serial numbers on the vz. 50 start at 650,001, starting from the discontinued serial number range of the vz. 27 pistol. Pistols manufactured at the Strakonice factory end in the 740,000 range. Pistols manufactured at Uherský Brod have 5-digit serial numbers preceded by a letter. That letter can change in the middle of a serial number series! The proof stamp is a lion superimposed on an "N", stamps on the left rear of the slide. The last two digits of the year of manufacture are stamped next to the proof stamp.